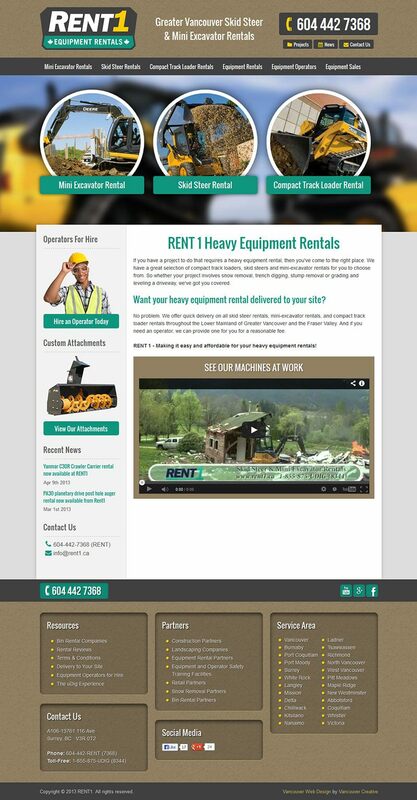 RENT 1 is a Vancouver equipment rental company specializing in Mini Excavators, Skid Steers and Compact Track Loaders for commercial and residential use. They offer the guaranteed lowest rates for long term rentals throughout Greater Vancouver. The website was built in Drupal and features a robust equipment rental catalog with a fully linked attachments catalog, each equipment rental has a review section (which is only visible when populated.) There’s also a Projects area with videos and summaries of the equipment which links to the specific products used, and to top it all off the website is fully responsive.